We want a 3.3V DC as output which is also in the range. 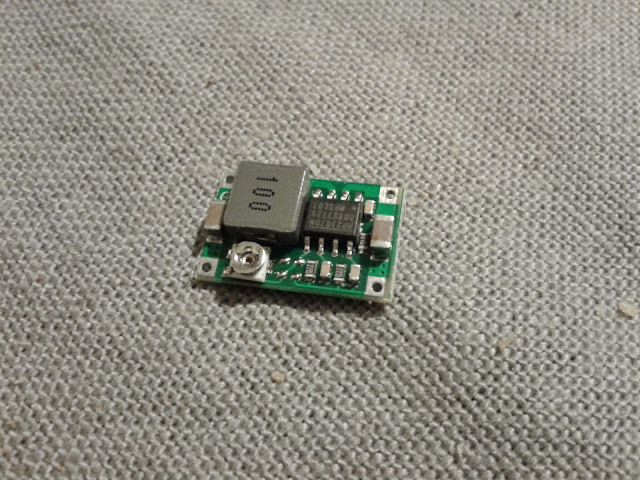 We are here 1.7V lower than the input and is no problem with this converter but some of them require a voltage difference of e.g. 1V. We had no point of knowing here as it was not specified but I was pretty confident as 1.7V is already a fairly big difference. 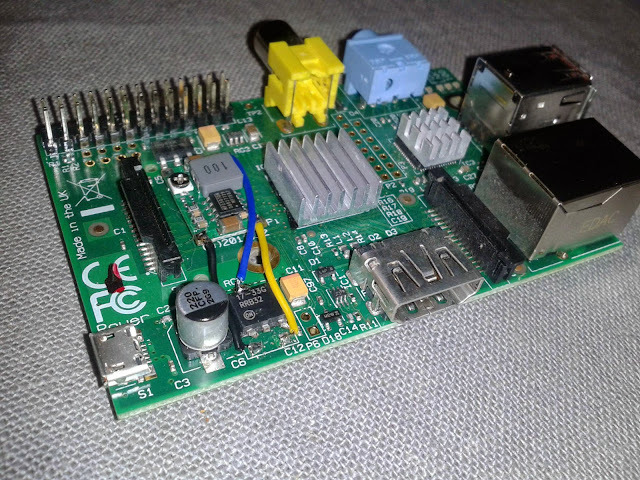 This should be fine as well since my Raspberry Pi runs on a 5V 1A power supply. We should therefore expect something lower than 96%. Too bad we don't get a formula. The good news is, the closer the input is to the output the higher the efficiency. Higher frequencies decrease the efficiency for a given input/output ratio but also impacts the transient response (see: reference). 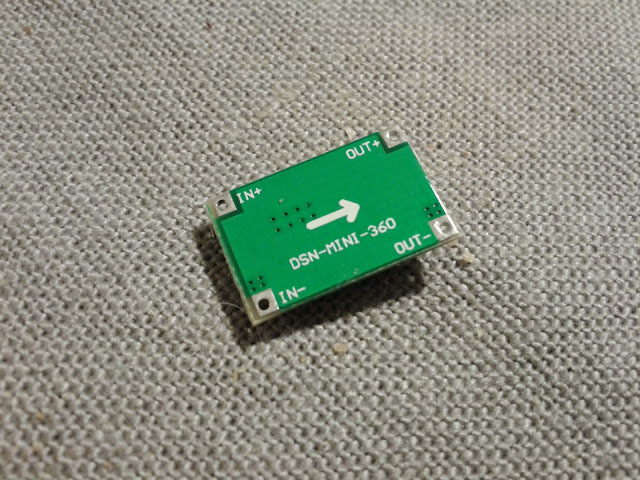 I then decided not to remove the regulator (unlike this mod) but to cut its pins and solder wires to the dc step down to the pads on the pcb instead. The best way to wire the regulator is to solder GND (black wire) and Vin (yellow wire) first (you don't need to wire both GND on the converter as they are common). 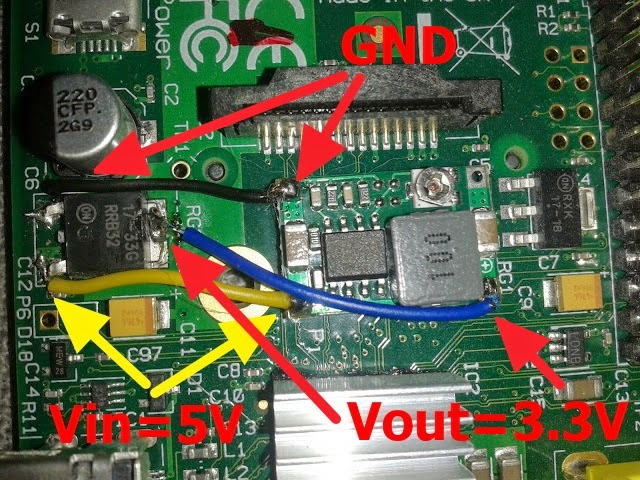 Connect the power to the RPi and measure the Vout (blue wire) with a multimeter (put the red test lead of your multimeter on Vout and the black one one GND) and turn the screw of the converter until your multimeter reads 3.3V DC. You can now solder Vout (the blue wire on the picture) to the PI. You're done! instead of its linear regulator. This project cost me 1.29 USD + 10mins and works perfectly! !